Are you ready to break out of the ordinary? Do you have the itch to move and try something new? We at Harborside Village know that the ordinary is vastly overrated and we want to show you what it’s like to live in an owner operated, owner managed community. We care about maintaining our incredibly waterfront apartments and giving you options for your new home. At Harborside, every unit comes with a washer/dryer, dishwasher, walk-in closets, central air conditioning, and additional storage space. You’ll also have use of the swimming pool and tennis court as a resident. All untis are cable ready with beautiful courtyard, waterview, or waterfront apartment views. All of these comforts come standard in our units because we care about our residents and want you to be happy with your home! Having a good community that you can rely on is essential to all living situations. Harborside has on-site management and 24-hour emergency maintenance. We know things happen and we want you to be covered in the event of an emergency. We are close to public transportation, a little less than a mile from Mariner Point Park, and near many schools and colleges. There are three different floor plans: two one bedroom plans and a two bedroom plan. There is a bathroom for every bedroom, no matter which floor plan you pick. With the wall-to-wall carpeting, eat-in kitchen, and sixteen-foot patio or balcony, you can make your home fit you! A separate living and dining room means that you have an extra space to use how you choose to use it. Spice your life up and make Harborside Village your new home! To learn more about The Benefits of Living in Harborside Village, please give us a call at 410-679-1130 or send us an email at leasing@harborsidevillage.com. 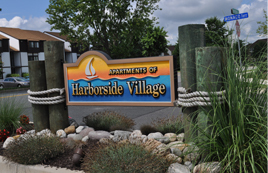 You can also request a brochure to learn more about life at Harborside Village on our website! This entry was posted on Friday, December 13th, 2013	at 6:57 pm	. Both comments and pings are currently closed.